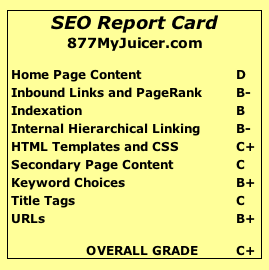 Andrew Casey, founder and CEO of 877MyJuicer.com, asked for an “SEO Report Card” for his site. As always, I’m happy to oblige. Andrew started this business in 2004 by selling juicers on eBay. Over the past 6 years, he has grown his startup into a million dollar company with its own ecommerce site that sells a variety of healthy gadgets. Andrew also offers a free blog and newsletter devoted to enabling healthy lifestyles. But how does his site, 877MyJuicer.com, fare in terms of search engine optimization? Let’s have a look. One of the first things I noticed when I browsed the 877MyJuicer.com home page was that the keywords come off as way too spammy. Particularly egregious is the block of text near the bottom of the page, which appears to be little more than a string of keywords and phrases, separated by commas and only barely wrangled into sentence form. The choice of keywords is rather scattershot as well on the home page. Rather than focus on a few desirable words and phrases, it seems like they’re throwing as many keywords as they can against the wall to see if any of them happen to stick. The copy on 877MyJuicer.com is written for search engines rather than humans, and the result is a bit jarring for the end user. It’s a bit like watching a commercial for a local car dealership broadcast at maximum volume at 3:00 in the morning. I found some insanely long meta descriptions too. Check out the one (using the “view source” function on your browser) on www.877myjuicer.com/tailgator-portable-gas-powered-blender-w-cordura-case.html, for example. If keyword stuffing offered any kind of significant SEO advantage, the tradeoff in the end user experience might be worth it. However, the major search engines have gotten wise to this antiquated tactic. Google’s algorithms, in particular, will either penalize a website that is blatantly spammy, or will flag it for manual review. Actually, using dodgy SEO tactics (such as keyword stuffing) carries a little more risk these days than it used to. Some black hat SEOs have adopted a tactic of buying links for their competitors in an effort to get them penalized by the search engines. The search engines, for the most part, are aware of this practice, so shady inbound links in and of themselves are generally not enough to get a website placed on Google’s naughty list. However, a website with dubious links and spammy web copy is just asking to be penalized or banned. So, in short, it’s best not to take any chances. Keyword stuffing offers no real SEO benefit, and will probably only hurt the website in the long run. To get the most SEO benefit from inbound links, they should contain keywords or phrases in the anchor text that folks will actually type into a search engine. For example, inbound links to 877MyJuicer.com containing the words “juicer” or “juicers” would really help the website rank higher for those search terms. But this needs to be done within reason; if it looks unnatural or engineered, it could harm more than help. Checking SEOmoz’s Open Site Explorer, we see that the majority of inbound links pointing to 877MyJuicer.com contain some or all of the site’s URL in the anchor text (“877myjuicer.com,” “http://www.877myjuicer.com,” “www.877myjuicer.com,” etc.). Generally speaking, people aren’t going to be using Google to search for “877myjuicer.com,” so linking it as anchor text provides little SEO advantage. There are a few keyword-rich links containing the anchor text “juicers,” “juicer,” and “steam juicer,” but those seem to be the exception rather than the rule. There’s definitely room for improvement on this front. 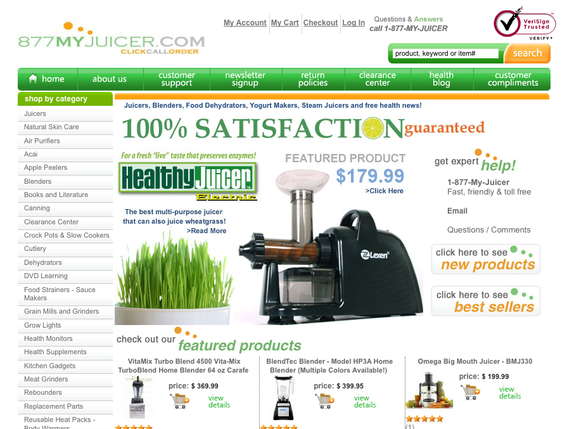 877MyJuicer.com has created good groundwork for SEO with its “Juicy Josh Health Blog.” The blog is updated somewhat regularly with well-written, unique content that benefits the visitor. Unfortunately, the blog’s current format is basically a big wall of text. A few more visuals might make the information more visually pleasing and entice the visitor to keep reading (or even click that link to 877MyJuicer.com). Photos of Andrew and the other folks at 877MyJuicer.com might encourage more interaction and more comments. Smiling, happy faces are always a good way to humanize an organization and make it more accessible to the rest of the online community. Bloggers link to other bloggers, not to faceless corporate entities, so personalizing the blog would be a good way to encourage additional interaction and interlinking, which will boost 877MyJuicer.com’s overall SEO.